Well, maybe a little change is enough for now! A great example of my messy handbag habit; I used to throw a huge bottle of deodorant into my bag which took up too much room and I would lose the lid and somehow spray the insides of my bag to death so I then switched to a perfume bottle which then made my arm want to fall off (I always buy the larger sizes!) As you can see, I was not doing too well! 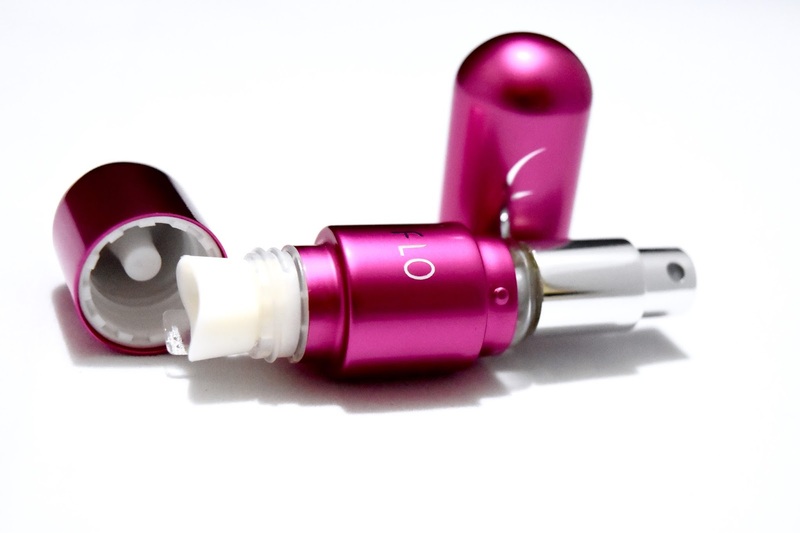 I kid you not, this 5ml FLO Atomizer will become a staple in your handbag organisation! This has saved me, especially during work when I require a midday freshen-up. I was also quite surprised at how little I had to refill my bottle which is brilliant! Now I can relax knowing that I won't spray my bag's insides out or break my arm! Simply unscrew the bottom of the atomizer and spray your desired perfume into the bottle and re-seal. Now my other little gem is the Heart Perfume Necklace I received... I had never come across perfume jewellery so was extremely excited when FLO sent me this little beauty. The necklace itself is very similar to your typical locket pendant. The heart opens up so that you can place one of the 3 slow release reusable capsules inside after spritzing with your favourite scent. This will then release that beautiful perfume for 7 days! G E N I O U S!